That’s my crazy internal monologue. To be fair, I have done some pretty cool things this summer. Sure, I went to the beach only once, but that was once more than I did last summer. I did at least a few restaurant-patio jaunts. I went to a ballgame, and I visited Detroit a handful of other lovely times, including a trip to Eastern Market’s Sunday Street Market today. I ran a 5K on a vineyard yesterday. So why am I complaining? Because summer is just one of those wonderful things that the great majority of us will always want more of. We can’t make it longer. But we can savor the time that we have left with it. We can be present and delight in the things that we are able to do – including making memorable meals. In this spirit of be-here-now appreciation, I am kicking off a series of posts dedicated to one of the glorious summer staples: the fruit salad! Now, before you start conjuring images of the same ol’, same ol’ watermelon-grapes-pineapple-strawberries combo – know that these will not be your typical fruit salads, friends! 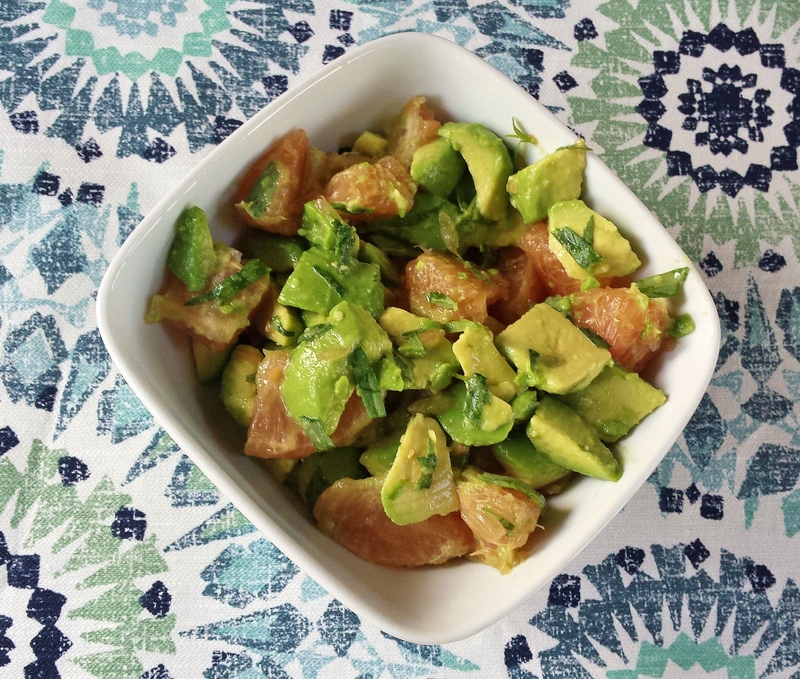 Exhibit A: this simple yet flavorful beauty, the grapefruit, avocado, and tarragon fruit salad. It’s four ingredients, incredibly quick and easy to make, and tastes AMAZING, if I do say so myself! I gobbled it up in one sitting! Mix ingredients together well and enjoy immediately. Makes two servings. See – how easy was that? All five of these fruit salads I will be posting over the next two weeks will amount to about two servings (some more generously sized than others). All will be simple to make, and, I hope, different from the typical fruit salads you see at every backyard barbecue. Here’s to healthful, easy cooking and making your last few summer days memorable!